Gotta Shop Till You Drop! Toulouse is nicknamed the “Pink City” for the rose-colored hue emanating from the sun-drenched bricks of the beautifully architected buildings comprising the city, but it should also be nicknamed “Shoppers Delight.” Every corner of the city seems to be packed with shops and markets are staged at various locations each day of the week. With our husbands heading into the office each day, it’s been up to us wives to scope out the best places to shop (and keep our pantries full). Nearly every morning we dutifully lace up our comfortable walking shoes and head out in search of cute new clothes ingredients for dinner and the next day’s lunch. 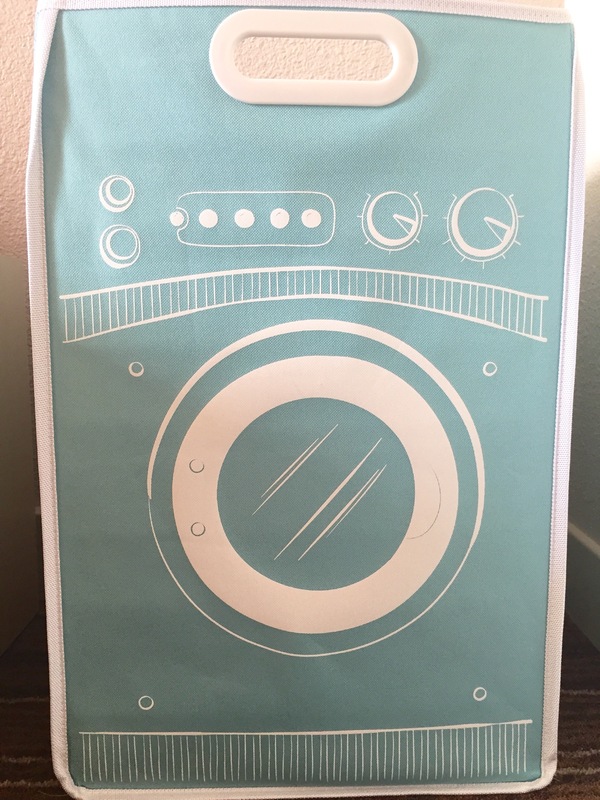 Afternoons are spent meandering through the streets near the Capitol in search of shoes home goods to make our apartments feel a bit more, well, homey–such as this cute little hamper I found at Casa. Yesterday we made a wonderful discovery–the summer sales have started! This means from now until August, all of the shops are marking their summer goods 30, 40 and up to 70 percent off! Well, we would have been remiss if we didn’t check out some of the sales. I was in desperate need of a new chapeau (hat) and sunglasses anyway. 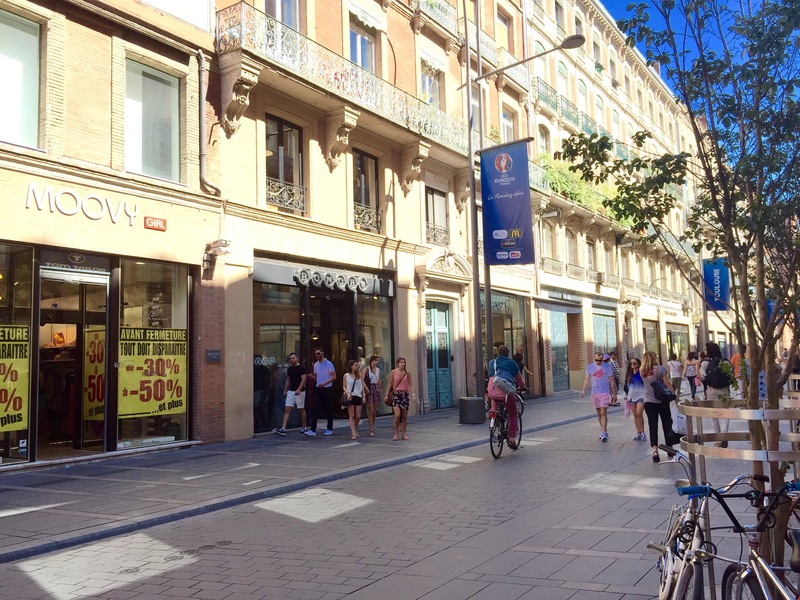 Now if you ever come to Toulouse to shop and want to hit the major chain brands, start on Rue d’Alsace-Lorraine. The long stretch of road is lined on both sides with major shops selling clothing, accessories and cosmetics. It’s reminiscent of a Beverly Hills or 5th Avenue in New York–except many of these stores are affordable on an average budget. 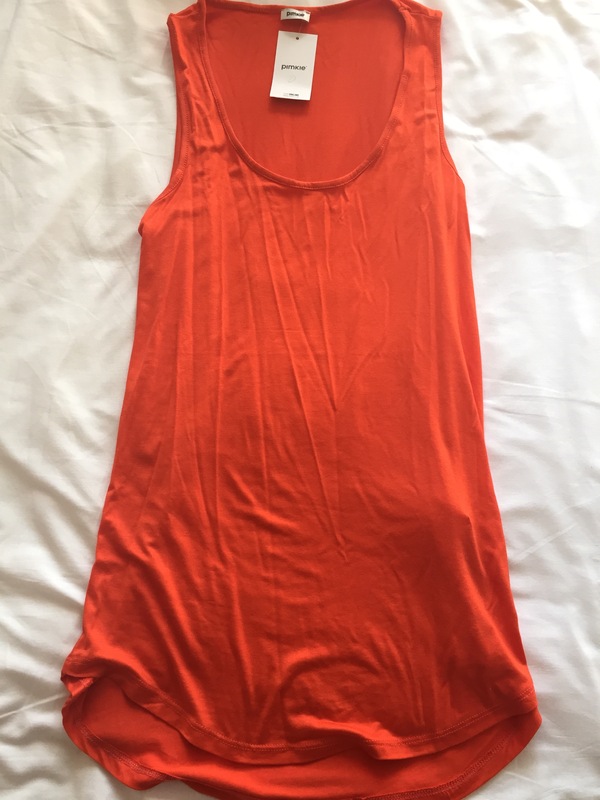 We started there and hit the Monoprix (clothing and cosmetics downstairs/grocery store upstairs), Pimkie, H&M, Zara and Zara Home (as well as a few shoe stores). I think everyone else in the city had the same idea as us to shop yesterday. The stores were packed with people practically pushing and shoving to find the best deals. Now, over the last three weeks, I’ve found the French to be generally pretty polite; they say “pardon” if they bump into or need to get by you and cheerfully ring the little bells on their bikes if they are passing you from behind. Apparently, though, when the summer sales start the gloves come off. I can’t tell you how many people practically nudged me out of the way by inching their way closer until I had to move or reached right in front of me to grab something as if I were invisible. It was a survival of the fittest. May the fastest shopper win! 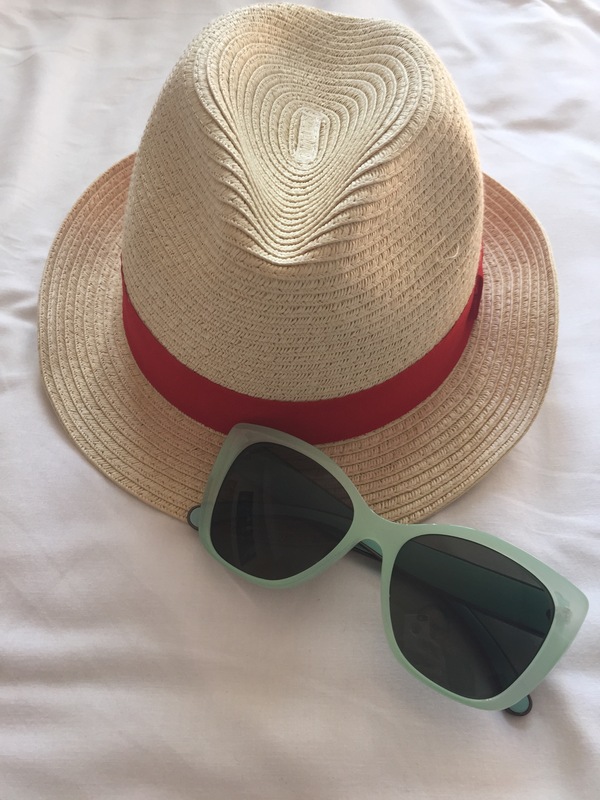 Luck was on my side and I managed to find the hat and sunglasses I needed. 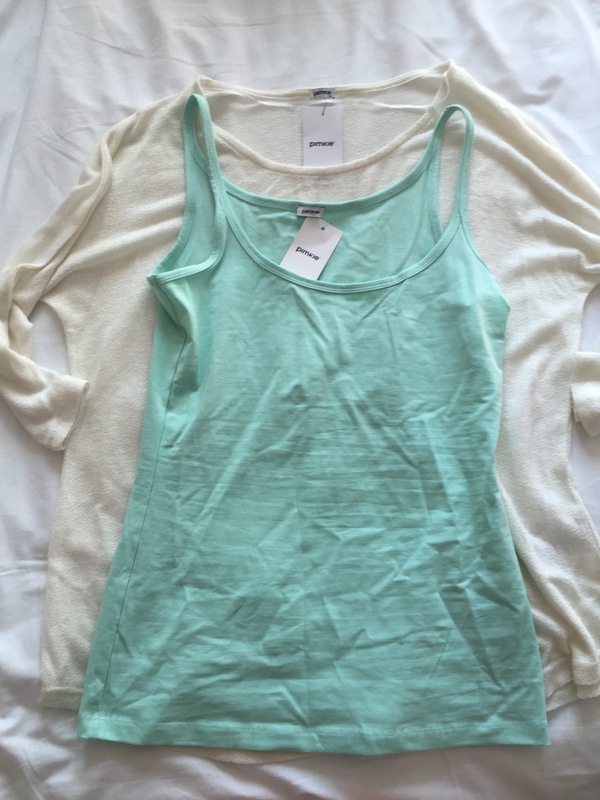 I also found a few cheap, light sweaters, perfect for covering up in the hot sun or staying warm in the cool shade, and shirts to pair with them. Yes, I need to iron. No judging! Side note: So far it seems that Toulouse does not get humidity–at least compared to Atlanta, Georgia. When you go out at the warmest part of the day, you can fry in the sun and then get chilly in the shade–especially if there’s a good breeze blowing. The open air markets in Toulouse really require a separate post on their own because they are so fabulous. So for today, I’ll stick with the brick and mortar shops. As I mentioned, you can definitely find major chain brands. For those with a more sophisticated budget, head to Rues des Arts, Boulbonne and Croix-Baragnon or Place Victor-Hugo. They are sprinkled with shops selling some of the top names in haute couture. 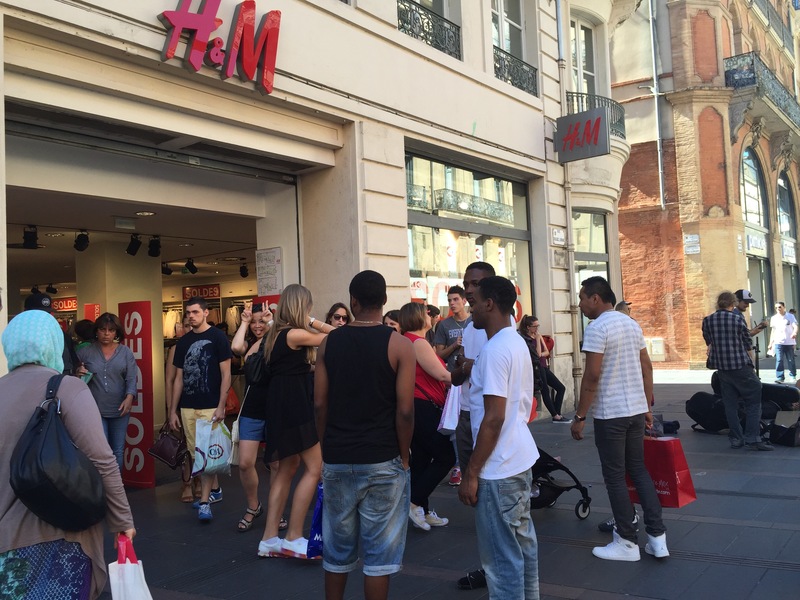 Fashionistas can rejoice because, according to the Toulouse Tourism website, many famous brands originated here, including The Kooples, Marchand Drapier and 7Robes and many up and coming designers sell their goods in pop-up shops. If giant department stores are more your speed, head to Galeries Lafayette on rue Lapeyrouse. Like a Macy’s in the U.S., this store has everything from chic French clothing labels to accessories, perfumes and stylish household goods. Prefer vintage? 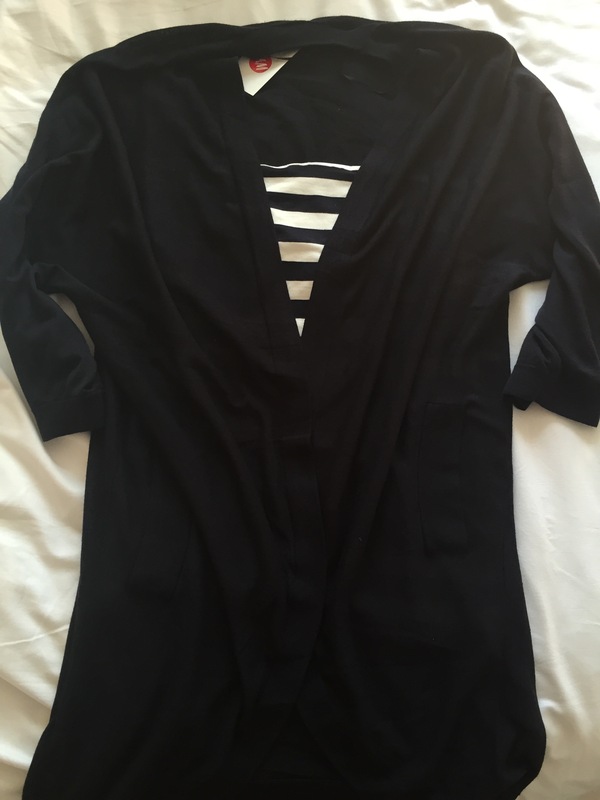 Look no further than the secondhand shops on Place de la Bourse and Rues Cujas and Sainte-Ursule. Seeking something sparkly? Jewelry stores seem to be as common as Starbucks in New York around here, so stroll around the city and see what catches your eye. This is all just in the city center. Venture a few miles out of downtown and you can find a big shopping mall and department stores such as Ikea (in case you were wondering, Ikea is the same in France as it is in the U.S.–and Matt still hates it just as much). 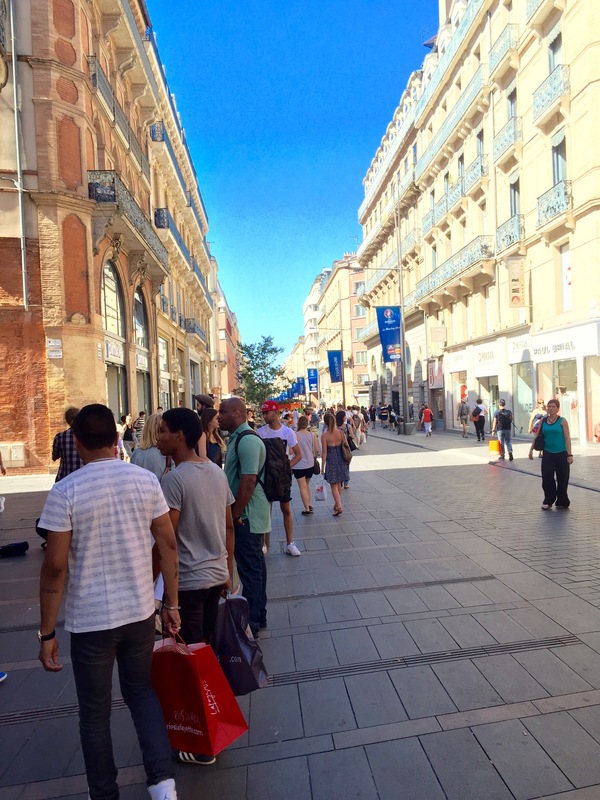 As you can see, there’s a lot of shopping to be done in Toulouse–which explains why I’m averaging at least five miles a day in walking. The good news? At least it’s not just my wallet that’s getting lighter.